So I came across something interesting. All java .class files have "CAFEBABE" as the beginning hex characters. I. ba[i] stores byte values. We used to go to lunch at a place called St Michael's Alley. According to local legend, in the deep dark past, the Grateful Dead used to perform there before they made it big. It was a pretty funky place that was definitely a Grateful Dead Kinda Place. When Jerry died, they even put up a little Buddhist-esque shrine. When we used to go there, we referred to the place as Cafe Dead. Somewhere along the line it was noticed that this was a HEX number. I was re-vamping some file format code and needed a couple of magic numbers: one for the persistent object file, and one for classes. I used CAFEDEAD for the object file format, and in grepping for 4 character hex words that fit after CAFE (it seemed to be a good theme) I hit on BABE and decided to use it. At that time, it didn't seem terribly important or destined to go anywhere but the trash-can of history. So CAFEBABE became the class file format, and CAFEDEAD was the persistent object format. But the persistent object facility went away, and along with it went the use of CAFEDEAD - it was eventually replaced by RMI. 1. PPrint is for displaying the Collection (result) with proper formatting. 4. Be careful, don't consider File object representing a directory as a Readable file otherwise you'll get a [ FileNotFoundException : Access Denied]. 5. Rest of the code should be understandable by itself. //abc.txt as it has the string "random"
We'll construct a list of a predefined size using a binary tree with support for delete operation. To find an element in this list is more efficient that linear search in arrays. The number of operations to be performed is less than or equal to the depth d of the tree plus 1 (d+1). 3. Nodes are numbered starting at 0 for the root of the binary tree. 10. lcount = 0 means that the node is a leaf node. 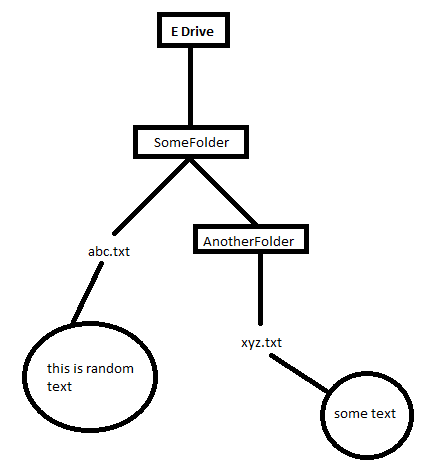 11. buildtree takes user input to build the binary tree structure of the list. 13. delete method deletes an element from the list and restructure the binary tree. 14. Display method displays the list content starting from element number 1 in the list. Threaded Binary Trees: Instead of containing a null pointer in its right field, a node with an empty right subtree points to its inorder successor. Such a pointer is called a thread. Note that the rightmost node in each tree still has a null right pointer, since it has no inorder successor. Such trees are called right in--threaded binary trees. A threaded binary tree eliminates the need for a stack in a nonrecursive traversal even if a father field is not available. To implement a right in-threaded binary tree under the dynamic node implementation of a binary tree, and extra logical field, rthread, is included within each node to indicate whether or not its right pointer is a thread. For consistency, the rthread field of the rightmost node of a tree (i.e. the last node in the tree's inorder traversal) is also set to true, although its right field remains null. which is in ascending order, as expected. Important sections of the code are italicized. They should be understood carefully.